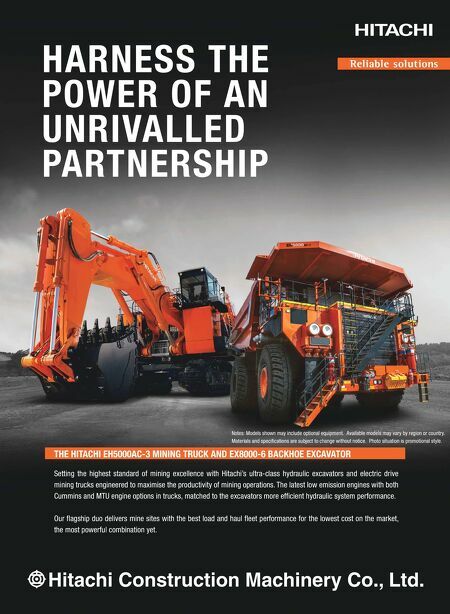 Setting the highest standard of mining excellence with Hitachi's ultra-class hydraulic excavators and electric drive mining trucks engineered to maximise the productivity of mining operations. The latest low emission engines with both Cummins and MTU engine options in trucks, matched to the excavators more efficient hydraulic system performance. Our flagship duo delivers mine sites with the best load and haul fleet performance for the lowest cost on the market, the most powerful combination yet. THE HITACHI EH5000AC-3 MINING TRUCK AND EX8000-6 BACKHOE EXCAVATOR HARNESS THE POWER OF AN UNRIVALLED PARTNERSHIP Notes: Models shown may include optional equipment. Available models may vary by region or country. Materials and specifications are subject to change without notice. Photo situation is promotional style.